Completely refurbished in mountain cabin style with American Indian decor with new furniture, linens, crockery, cutlery as well as new fridge and microwave, this little cottage is nestled in between some big trees and is down the winery lane from street. So quiet except for the birds. Outdoor patios and BBQ area to choose from. Eat each meal each day in a different spot as you look out across the meadow and big seasonal pond, as well as the overgrown hillside across the river. Almost in the middle of Triangle Rd that cuts across top of Mariposa so there is easy access to Yosemite's West gate (Hwy 140) for the valley floor, or Yosemite's South gate (Hwy 41) for access to Wawona, Big Trees and Badger Pass ski area. Take a break from Yosemite and hike our own property, or just take a book or guitar and picnic in one of the amazing spots by our own seasonal river, or simply relax under a big oak tree. We share the Winery Lane for access with Butterfly Creek Winery, so if you wander a little further down you can explore this lovely winery. It is the biggest in the area, which isn't saying much, but they have won many awards. Yes it is central California and gets hot in summer - but this cabin is an oasis from the heat thanks to the big cedars and oak. And at night we are above the fog and town lights, and below the snow (except a few days in Winter), so spectacularly clear nights are the norm for all star and moon gazers. Owner lives nearby on same grounds to serve any needs or questions. We have been visiting Yosemite for over 30 years. Long before we moved to this area we love so much. There is even a washer and dryer on the patio of main house, but who does laundry on vacation. Of course, it also has Dish TV, a Sony DVD system and Wifi. Detailed Guide Book and manager will take care of all your questions about what to do or where to go. In Winter, enjoy a wood burning fire in the stove insert. In Summer, living room has A/C for those few really sweltering days when the shade and new double pained windows are insufficient. Crib bed and high chair available. Decent size above ground pool is now open for the season. Extra large pool towels provided too. In summary, small cottage but cute as a button with multiple outdoor dining patios, fabulous views, extremely quiet, very safe and peaceful, big gardens to hang out in, all for less than a room in town. For many years in Silicon Valley I was a high tech marketeer. I often talked of one day going up into the mountains and forgetting to come back. Then a few years ago, after my last international trip, my son asked, "Dad, you keep talking about your mountain cabin. When are you going to do it?" For 5 years I lived in an old small house up the street. Then one day walking down the street I got suspicious as to what had happened to the sale of this property. It didn''t look like anyone was going in or out. Turns out the sale had fallen through, just like my nice one a little further across the valley. This property is very special to me even though it is old and not very fancy. But it has great views, lots of room to roam and not only did I get myself a house to live in, I got a cottage to rent to you, and a big studio workshop to pursue my hobby Safari Gold jewelry business. This is why people come to Mariposa and Yosemite - the most photographed natural wonder in North America. But our property is even more rural and quiet and peaceful. Land line for local calls or calling card usage. But seldom needed as cottage shaded for most of summer. Leave windows open. All that you needed. Refreshed for longer stays too. Note bathroom shower is over tub for those who like to soak. Free Firewood provided and starter setup in Winter only. High speed wifi as we have fiber optics internet to the cottage. Even extra big ones for the pool. High speed dedicated WIFI for your phones and computers and games. Winter only. Firewood provided free. Tea and local quality ground coffee, salt and sugar. Also some Emergency Rations. Of course a house needs some books and local quality magazines. Hike our own trails around the pool, down by the river. Picnic spots everywhere. For the real adventurous, cross the seasonal river and explore our jungle hill (adult supervision required). A favorite spot for morning coffee and evening sundowners. Often deer or wild turkeys will visit you. Or even a fox! This is where we expect you will spend most of your time. Even meals. Lovely umbrella is often not needed thanks to trees providing shade from California sun. Downhill ski at Yosemite Ski Lodge. Especially good for beginners and novices. Snow shoes too. Cross country skiing, from beginners to world class trails. WE will loan you snow chains for car. Nice 9 hole courses in Oakhurst and also in Yosemite at Wawona. Sorry. Doors are too narrow and there are 2 steps to each outside doorway. We are 30 miles from Yosemite National Park, but that is closer than most other Mariposa properties. Only a few motels near gate are closer. Scenic drive along Merced river.. whitewater rafting avail there too in Summer. The home was well stocked with soap, towels, firewood for winter, and kitchen basics. It was a great place to rest and cook after long hard hikes at Yosemite. And great laundry facility. I would reccomend and stay again. Beautiful scenery, comfortable cottage and a wonderful host. Comfortable beds, Working Internet and TV, and close to National parks. The winery at the end of the road is charming and reasonably priced. Martin is always Available for questions and help. Thank you Shelly. I want all guests to enjoy the magic of my property and the magnificence of Yosemite. I do love guests who seriously explore and hike, but still take time to sit and watch the wildlife. Thanks for visiting. Cozy little house close to Yosemite. Perfect little mountain get away in a 2 bedroom house. Tucked away in the mountains about 15 minute drive to quaint Mariposa and about 45 minutes to the entrance of Yosemite National Park. Had wild deer and turkeys in front of house almost daily! Outdoor eating spaces, fully stocked kitchen, ice chest, cable tv, and high speed internet. Was a great quiet getaway. Host lives next door and was very friendly. Highly recommend if you are wanting to get out to the country and don't mind a beautiful drive to the park. We had a great stay at Frontier Hill! We loved our stay in this cute little cottage in Mariposa. The beds were very comfortable and it was so nice and quiet. We enjoyed getting a chance to get away from our busy schedule and slow down and rest. Martin was so nice and gave us great advice about Yosemite and how to make the most of our trip! We’d definitely recommend this place! I do love happy hiking families who take the time to search the detailed areas of Yosemite to make the most of what is for many of you a once in a life time trip. And for many youngsters their first big exposure to the big outdoors, mountains and nature. So I do like to share my own hiking and child tramping and skiing experiences. Three great parts about this property were the comfortable queen bed, clean bathroom, and Martin was great to talk to. He shared great tips about visiting Yosemite. We did not have time to enjoy the pool or grounds around the cabin. The fridge and stove met our needs for the short time we stayed. We stayed during a heat wave and the air conditioning worked as needed. Our only problem was with spiders, mosquitoes, and wasps. Keep in mind this cottage is in the country and these things are hard to control. My husband is a cautious driver and the drive to Yosemite took about and hour. You are right. We are way off in the countryside. Do expect we will do a better job with wasps. Right now the mosquitoes win some rounds, I win others. But we provide free mosquito candles and spray. As for spiders, we clear most of them, but they really help keep the flies and small bugs down. We are adjacent Butterfly Creek Winery and its own spectacular setting. 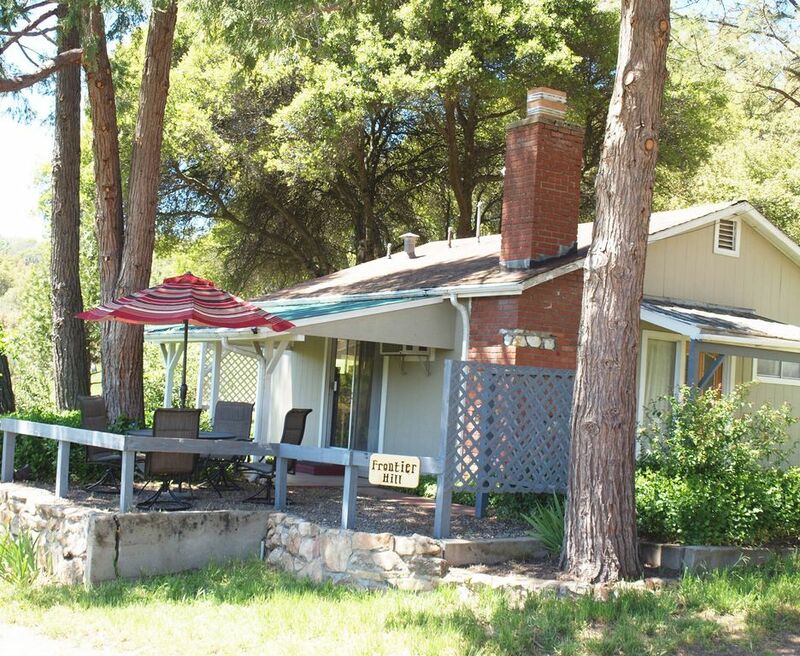 Wander down the lane and enjoy a glass from one of the premier Sierra Foothill wineries.